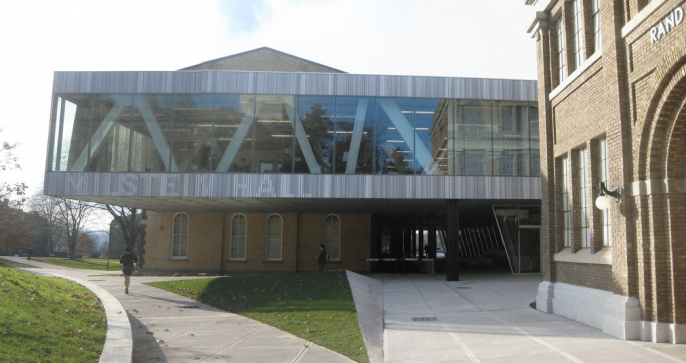 Cornell University's new architecture building designed by Rem Koolhaas' Office of Metropolitan Architecture is a “disaster” says Cornell University architecture professor Jonathan Ochshorn. “The code violations are egregious”, states Ochshorn. In this interview we discuss the conflict between architectural abstraction and the built environment. The architecture school's newest building cost over $55 million dollars, yet it's design doesn't comply with the most current edition of the International Building Code or the Building Code of New York State. Go here to read the detailed analysis by Professor Ochshorn –> Critique of Milstein Hall . The building has several flagrant code violations [1. revised 10/15/2013 Professor Ochshorn repeats what he said in the interview – Actually, the maximum allowable area is exceeded under current Codes, which would require a fire wall; but the building was found to be compliant under the peculiar 2002 Building Code of NYS, based on a unique provision added by NYS legislators that was subsequently repealed in the 2007 and 2010 Codes. So Milstein Hall was nonconforming (not meeting the standards of current codes), but not noncompliant in this respect. There were, however, other instances of noncompliance (I mentioned the Fine Arts Library on the 3rd floor of Rand Hall, and the crit room space with only one exit).] The building also leaks. The crit space on the ground floor lacks proper exiting. Cornell Architecture Professor Jonathan Ochshorn goes into detail about the design flaws of this building on his interview on the Business of Architecture show here. In this interview Ochshorn also points out the flaws with USGBC's LEED rating system. What say you? Have we taken starchitecture too far? Is OMA to be applauded or upbraided for flaunting practical considerations like the building code and weather-tightness? Read Professor Ochshorn's detailed analysis here: Critique of Milstein Hall. Regardless of one’s thoughts regarding starchitecture, Ochshorn’s research and presentation are a good solid read for anyone who has done institutional work, interested in larger projects or interested in actual buildings (and all their wondrous potential to go wrong). I am looking forward to the completion of the “Function and Flexibility” portion, one that will probably be the most difficult to properly document and evaluate. Very good stuff. On an eight figure project or larger, it is not a matter of “if” there will be a lawsuit, rather “when will it be filed and for how much”? Often contractors will file bankruptcy at the drop of a hat if they are anywhere near insolvent, leaving the architect in a room full of lawyers sitting next to an empty seat. Rarely, do I respond to posts. However, in this particular instance been a practicing architect well over 40 years. I would like to offer the following comment. senior architectural students at the University, whereby they could perform a critical analysis of the building that they are currently working in. It would then give the students a working knowledge of what the architectural practice is really all about and where the responsibilities lie. It’s been my experience over the years that 90% of the architects that I know concentrate on the cartoons(design and contract documents) and not the practical applications and liabilities at an architect is responsible for. Secondly, from my brief reading it appears in a building permit was issued. Consequently, there are some responsibilities lie in the governing authority. Barry it is great to have someone of your experience in the industry weigh in with your thoughts and opinion. I appreciate your input. The only thing more annoying (and VASTLY) than “starchitecture” are the pedantic heel-nippers trying to win their own bit of infamy by taking bites out of starchitects’ work. How is what Enoch put together ‘pedantic heel nipping’? Not only should we expect OMA to design to code but maybe even exceed the code in terms of fresh air, daylight, exiting and future expansion. The point to this and all of the other “pedestrians” complaining (walkie talkie etc) is because architects have failed over and over to be inventive within the parameters of budget, life safety, sustainability and common sense construction methods and techniques. In addition, the real issue is why a school of architecture needs a Rem K to design for them? I say shame on Cornell for having to look outside of its walls to design a school expansion for themselves, but,..oh ya,..architects cant design good buildings anymore. I say hats off to Enoch. I hope he makes this a series because these are the issues critical to the future of the profession contained within these failures. Failures in terms of priorities (hiring a starchitect to screw up) and “non-structural failures” alike. Chris, Rem is actually a Cornell graduate so the building has been designed by someone who has experienced the culture and the environment, someone who is molded by the institute itself. So I think that shaming the university here is not the right move to make. I went to the same building for my classes for more than a year and Mr Ochshorn’s evaluation is thorough but hypothetical. I am not a fan of Milstein not because of these issues but because of the sterile learning environment it enforces in the students. The connections between the workshops,labs and studios is what has bothered the students rather than its code violations. The users of the building need to be prioritized before any discussion over legalities and structure commences. The civilized thing to do is there should be a public debate. An open discussion between Mr. Koolhaas and Mr. Ochshorn, sponsored by the Cornell School Of Architecture, to fully discuss and constructively explore ALL of the issues raised by the art and performance of Milstein Hall…. Now that would be an educational experience ! I agree with David, there are many at fault here. Again, my real intention is not to throw OMA under the bus solely because they’re the big dog. What I can’t come to grips with is how often we hear about big oversights and big problems with big projects. How can it get this far without somebody catching these things? Is the joint-venture firm culpable? Yes I’d assume. Here we are working to show our value, our worth and our relevance. We use fancy BIM tools and other digital modeling tools to show how much we can predict and prevent. Yet, some of these issues here were things I was taught to check and double check when I was fresh out of school. It just “smells” too much like ego forcing a design that was still a bit unripe. I really don’t like our profession getting such bad press. Lately, there have been many big name architects getting bad press for seemingly ego-driven projects. This “Objective Critique” is a non-critique; after arguing for nearly 20 minutes that the building area is too great for the construction type (his primary claim), Mr. Oschorn then states that at the time the permit was issued the floor area did in-fact satisfy the NY state building code (in the US states rights rule, the IBC is only relevant in-so-far as the states adopt it). As for the leaking, is he certain that the building envelope was poorly designed (the fault of the Architect) or could it perhaps have been poorly executed (the fault of the GC). OMA and the local architect should file a deformation suit against the cranky professor. These are very serious charges and it is highly irresponsible and highly unethical to level them while simultaneously admitting that what was done was done within the scope of the then current legal framework. Keith, see footnote 1 for Professor Ochshorn’s commentary on non-compliant v.s. non-conforming. See also the original analysis (found in the show notes) for complete information. Thanks for visiting Business of Architecture and sharing your perspective on this interview. As stated by others, this isn’t an attack on Rem K specifically other than he is part of the celebrity status who should be setting an example. I understand how no building is perfect and sometimes there needs to be additional fixes or tweaks especially with new or unusual designs. That’s part of research and innovation. I’ve been involved in meetings on my own projects where we’ve had to work through things. However, after scanning through the research and writings of Jonathan Oschorn, this is not your run-of-the-mill oversight. We are all responsible in the same degree, but I’d like to think the rest of us out here are doing a good job. While I haven’t read the Professor’s complete report as linked above, there is certainly a lot going on in this story and its comments. No architect is perfect, we can all make mistakes. Contractors can also make them for us. The first person to comment (JFS_II) has the most valid point from practice, I can’t count how many ways there are to skin the cat, in fact i just found this article from a post on ‘think | architect’ titled “more than one way to get there”. Just because the building has water infiltration issue doesn’t mean that the detail drawing is to fault, I would more often start an investigation at how the envelope was built. Quality craftsmanship is again on the GC’s shoulders. My first impressions with the professor’s criticisms were, “how did this pass plan review, and THEN inspection?” My second thought was, “I doubt Rem had much at all to do with the production of the document set, considering how large firms operate, its no surprise. But why go after someone who has CLEARLY made the built environment a better place from an assertion of incompetency?” thats a foul move to me. If you werent there, in the meetings, reading the emails, making the deadlines, then i think you really cant fault Rem Koolhaus for perpetrating a disaster- far from it, what is however is that this Professor is probably spewing this to his students. I give him an F.
Joshua, I think you’re getting at the complex series of issues that are at play in this project or one like it. BTW I am the author of think|architect so I know the article you’re referring to in your post. That article deals with existing buildings and not new construction. I don’t know the difference in the NY code so I can’t speak to those technical details, and I don’t understand the Type VB reference. That doesn’t make sense. My overall point is time and time again, we see a big project, big name architect and big problems (perhaps more likely to be published). I totally understand errors on the builder’s side, seen enough of those. However, for this professor to step out like this and make these allegations without good backup means he is correct or really knows nothing at all. There can’t be a middle ground. Hi Lee and Joshua, thanks for the dialog. My Type VB reference: as a Type VB building it exceeds the allowable area per Table 503. It is a Type VB building because it is connected to Sibley Hall which is masonry exterior/wood framed interior. yeah – if anyone is *more* at fault than OMA, it’s the joint venture architect!! How much research has this professor done? There are a variety of ways to get around strict interpretations of the building code… and a variety of reasons to deviate from it. Often architects will hire a building code consultant, who can interpret the code and point out how and why the building should be allowed to deviate from a strict interpretation of the code. Same goes for things like allowable area. Building codes are living documents, and it’s not unheard of to come up with an acceptable alternative solution to one of its stipulations. Saying it’s unsafe just because of the size of the floor area is taking the building code incredibly literally, and ignores or cheapens a lot of work that was done by a lot of different people to ensure it is safe. That being said – a lot of professors have barely even practiced – is this guy a practicing architect? Or is he yet another jaded academic? Yes, alternative means of compliance are allowable per the IBC, but if you listen to the interview you will hear more of the story. Good questions for sure. Where are the owners, clients, and developers that want to pay for this? Blaming architects for this problem proves your ignorance of the industry. Architects can only provide what clients are willing to commission and ultimately pay for. If our ‘architecture’ is cheap and unsubstantial, look to our throw-away society and profit-over-substance mentality that most developers subscribe to. Well, Jerry, if you’re going to have a haughty attitude and call me ignorant, this isn’t going to be pleasant. I’ve been around long enough to know what the industry, clients, etc. 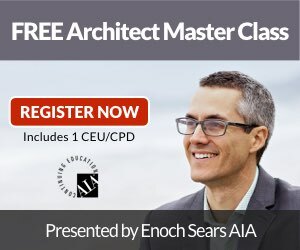 are willing to pay for and pay to an architect. I have plenty of my own stories. I never made any statements to let anyone else off of the hook. But how do you explain some of these egregious errors? The building is over budget and difficult to build and seal. I don’t blame Rem K for everything, but his office has plenty of capable people to see that all of the details come together. They spent plenty of time designing a complex building. You’d think they could take a bit more time to work out these basic functional and life safety issues. Perhaps the client got romanced by the big name and share in the responsibility on some level. Isn’t the architect the leader in the process of design? Should the client or contractor do a code check? And yes, where was the local municipality on this? If the allegations are true, the architect is at fault. But so is the governmental reviewing agency (local building department, office of the state architect, or university architect). If the violations are as egregious as claimed, a cursory glance at the drawings by the enforcement agencies should have caught the violations before the building was built and/or during construction. This is a complete lack of oversight on all sides. Why do we keep hearing stories of epic failures from big name firms? Is it that all of us architects are failing, but only the big boys (and girls) get the press? Do we expect more out of them than ourselves? I see a trend emerging that I might write about where we have people working to solve environmental issues so they become technicians of software and computational methods of design. On another side we have the architect egoist making grand gestures of ideological beliefs to submit for legendary status of “A”rchitecture. Where are the architects that can design a great building that works, functions, meets code, doesn’t leak, and looks amazing? With more technology are we going to create architecture that will survive for millennia like our ancestors? I just shake my head sometimes. Amen brother. This is a religion.